Highlights from the video-game retailer's latest earnings call. There isn't much certainty around GameStop's (NYSE:GME) business right now. The specialty retailer lacks a permanent CEO and is exploring a sale that might (or might not) result in its removal from public markets. 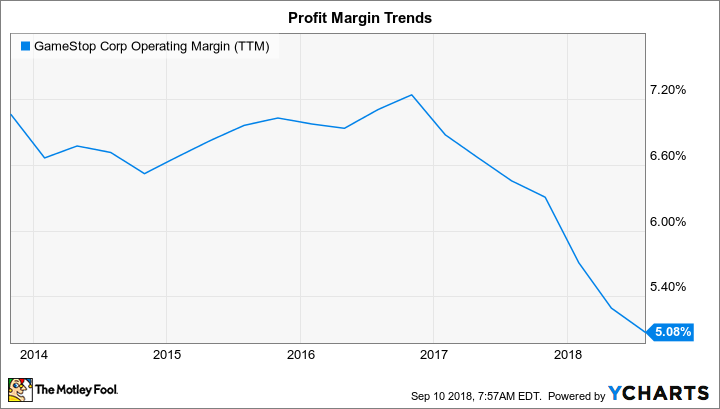 Meanwhile, sales and profit margins are declining as the company struggles with unfavorable shifts in the video-game market and spotty performances by its newer business lines. Against that risky backdrop, interim CEO Shane Kim held a conference call with investors to discuss GameStop's latest operating trends and its plans for the back half of the year. Below are three key highlights from that presentation. GameStop met executives' high-level targets as sales at existing locations were roughly flat to mark a solid improvement over the prior quarter's 5% slump. Yet, digging a bit deeper, its results described a business that's still struggling with uneven demand. The new and pre-owned software segments both declined, and that shift combined with an increase in low-margin hardware sales to send profitability lower for the video-game unit and the broader business. GME Operating Margin (TTM) data by YCharts. The collectibles business endured weaker traffic and lower gross margins, but it posted steady sales growth. GameStop's consumer tech segment had mixed results, too, with sales falling 10% but earnings improving significantly. GameStop affirmed its full-year outlook that calls for sales to range from flat to a decline of 5% as adjusted earnings come in between $3 per share and $3.35 per share. The profit total through the first half of the year amounts to just $0.43 per share, though, which means nearly 90% of earnings will come over the next six months. The retailer pointed investors toward a stacked pipeline of video-game releases in franchises like Call of Duty, Battlefield, Super Mario Party, and NBA 2K as support for that aggressive outlook. Their optimism extends to the collectibles division, too, and to an accessories segment that's being lifted right now by the popularity of Fortnite. Executives didn't have any concrete updates to share about the ongoing talks with potential buyers of the business. Instead, the management team is asking for patience from investors as they go through a process that might not result in any transaction. If those talks break down, other key questions going forward start with the retailer's choice of a new chief executive. GameStop tried to assure shareholders that whatever path the company lands on will have healthy returns as its guiding force. "We have a long track record of being a shareholder-friendly company, and we'll continue to be," Lloyd said. "We appreciate the support of our long-term shareholders as we navigate the changes in our organization and our ongoing strategic review."